I love photography. If there was more time in the day, I would definitely learn more about it and practice more often. One of my absolute favorite bloggers is Ashley Ann (I know I’ve mentioned this before) and I really loved this post this week. It captures the small things that could easily have been overlooked on a busy Easter Sunday. Are you tired of the mommy articles yet? I kind of am, but I do need to share these… 10 Things Working Mothers Don’t Want To Hear and 10 Things People Say That Drive Working Moms Crazy. Please take note. Baseball is back and we are excited in the Gilbertson household. This week I stumbled upon Bleacher Creatures, specifically the Matt Harvey Bleacher Creature. How adorable? I definitely think C-man needs one of these. You know it’s the little things when you get excited about organic fractionated coconut oil. 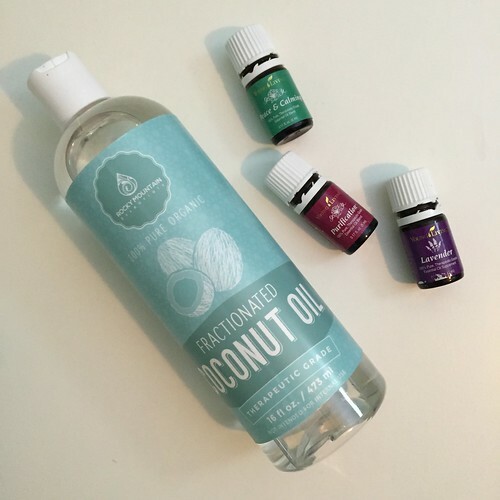 Fractionated coconut oil does not harden like regular coconut oil does and I’m so excited to use it as a carrier oil with my essential oils. I’m going to be mixing up some concoctions this weekend. Don’t forget to check out what these ladies are loving too! Misha // Mary Beth // Amanda // Laura and welcome to Aileen who is joining in! I’d like to know more about this coconut oil sometime….maybe you’ll share some of those ‘recipes’/tips another time. Thanks. And….I wish that gal could write w/o all the cursing 😦 In my opinion it undermines the good points she makes, but, hey! I’m an old fogey. I will definitely share my favorite recipes! I completely agree about the colorful language, it’s not really my cup of tea either.